An original manuscript written by Sydney Octavius Chase to be read at the Waverly Silver Jubilee on March 14, 1940. 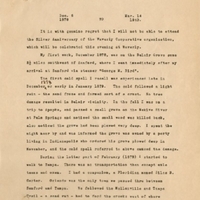 The manuscript chronicles Chase's career with topics including his first work on Belair Grove in December 1878, the cold spell of December 1878 to January 1879, traveling to Tampa by foot with Silas B. Carter, purchasing land in present-day Winter Haven, and his planting his first grove near Sanford in 1881. Original manuscript by Sydney Ocatvius Chase: "Dec. 6, 1878 to Mar. 14, 1940," 1940: box 173, folder 9.52, Chase Collection (MS 14), Special and Area Studies Collections, George A. Smathers Libraries, University of Florida, Gainesville, Florida. Digital reproduction of original manuscriptt by Sydney Ocatvius Chase: "Dec. 6, 1878 to Mar. 14, 1940," 1940. Chase, Sydney Octavius. “"Dec. 6, 1878 to Mar. 14, 1940" Manuscript.” RICHES of Central Florida accessed April 26, 2019, https://richesmi.cah.ucf.edu/omeka/items/show/2545.